I’m old fashioned about some things; writing utensils for one. I still use pencils and fountain pens. I love good quality pencils. By the way, Mirado Black Warriors are the best pencil in the world. I love fountain pens. My favorite pen is the old 60s Sheaffer student Skrip® cartridge pen. I had five of them up until last night. I’ve been having issues with my black pen. Ink would not flow properly through the nib on this pen for a while now. I’ve cleaned and fiddled with it enough already. I finally gave up on it last night. What I didn’t realize at the time that I tossed that pen into the trash is that they are pretty damned rare these days. The ones I have found on eBay are downright expensive. I did find two to bid on. My max bid + S/H is $5.00/pen. I just can’t justify the $35-$100 some of these people want for old Sheaffer fountain pens. It’s ridiculous. Hell, I ought to sell my three good ones and the two others for parts. I could probably make the household utility bills for July with the money from that sale; judging by what these silly pens are going for on eBay right now. These were probably a buck or so when I bought them as a kid. Amazing. Posted by V. T. Eric Layton on 13 June 2011 in Whatnots and tagged fountain pens, Mirado Black Warrior, pencils, pens, Sheaffer, writing. Wow, I got through college on a pair of Sheaffer Skrip pens, one of them I kept blue ink in, and the other had black. I have no idea what happened to them, but I do remember they had both vanished by the time we moved to an apartment in 1994. 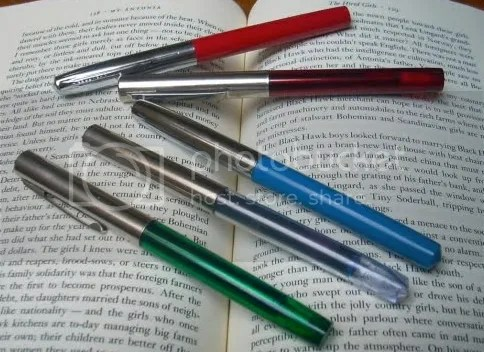 BTW you can still get Sheaffer cartridge fountain pens. They just don’t go by the name of Skrip any more, and their cost is $30 and up.